Millerton Lake is located in the southern portion of California's Central Valley in Fresno and Madera counties. The lake lies in the upper San Joaquin River Watershed. Its main purposes are reclamation, flood control, irrigation, and recreation. Millerton Lake was created in 1944 by Friant Dam, which was completed in 1942. The lake has a storage capacity of 520,500 acre-feet and supplies Central Valley Project water users. It covers 4900 acres when full. The lake and the majority of adjacent lands are owned by the Federal Bureau of Reclamation (Reclamation). Land within the project area is managed by Reclamation and California State Parks, which operates Millerton Lake State Recreation Area (SRA). Reclamation and State Parks, in a cooperative effort, prepared the Resource Management Plan and General Plan (RMP/GP) for the Millerton Lake area. The cooperative effort afforded State Parks and Reclamation an opportunity to coordinate management of similar resources in the area. The RMP/GP specifically addressed Millerton Lake SRA, including the entire lake and all Reclamation land surrounding the lake. 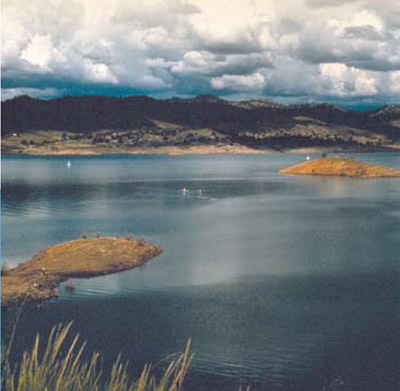 The objectives of the joint plan were to establish management objectives, guidelines, and actions implemented by Reclamation directly, or through its recreation contract with State Parks, that protects the water supply and water quality functions of Millerton Lake; protects and enhances natural and cultural resources in the SRA, consistent with Federal law and Reclamation policies; and provides recreational opportunities and facilities consistent with the Central Valley Project purposes and the policies of State Parks and Reclamation. In addition, the General Plan is the primary management guideline for defining a framework for resource stewardship, interpretation, facilities, visitor use, and services. General plans define an ultimate purpose, vision, and intent for management through goal statements, guidelines, and broad objectives, but stop short of defining specific objectives, methodologies, and designs for how to accomplish these goals. The RMP/GP is a long-term plan (with an approximate 20-year planning horizon) that guides specific actions in the Millerton Lake State Recreation Area and on Reclamation lands surrounding the lake. The RMP/GP serves as a Programmatic Environmental Impact Statement/Environmental Impact Report (PEIS/EIR). The documents may also be accessed on-line at the Bureau of Reclamation project website. For more information on Millerton Lake SRA, click here.